A chair is a chair is a chair? Well, not always. The high-end Italian furniture manufacturer Promemoria has teamed with eight prestigious interior designers — including six local talents — to customize its Bilou Bilou dining chair in a “Chairs For Charity” auction. 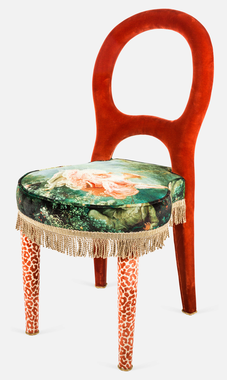 The one-of-a-kind chairs will be exhibited at Dragonette Ltd. during the 2015 Legends of La Cienega design festival Wednesday through Friday and remain on display through the May 19 online auction on Paddle8. Proceeds will benefit Habitat for Humanity of Greater Los Angeles. Designed by Romeo Sozzi in 1999, the Bilou Bilou recalls the classic 19th century Luigi Filippo chair, a parlor seat known for its balloon-shaped open back with a decidedly modern Milanese fashion-forward twist. Curvaceous yet minimalist and equally at home at a formal dining table or in the boudoir, the Bilou Bllou is made by hand in Promemoria’s Lake Como workrooms and offered in beech and leather (from $2,030) and in fully upholstered versions in velvet (from $2,920) and leather (from $3,610). For Chairs for Charity, the participating Los Angeles designers turned out a range of looks including sleek and tailored, poetic, and wild and woolly. Mary McDonald channeled a British school uniform vibe using red, black and gray velvet in a vertical stripe. 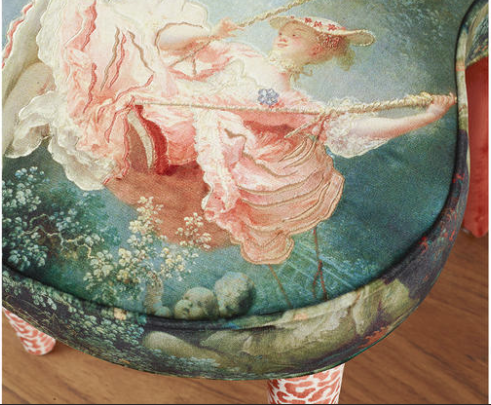 David Phoenix used Fortuny fabric for the seat, while Timothy Corrigan took a French rococo turn by printing the artist Fragonard’s The Swing onto velvet. Joan Behnke collaborated with designers Eve Durando and Meghan Rigney to create a skirted chair with a quote by Robert Browning laser cut into the leather. Adam Hunter used Romo’s Laughing Owl faux fur, which resembles feathers, on an ombre-lacquered Bilou Bilou and Cliff Fong added Icelandic sheepskin to the chair, which he designed with gray cerused wood legs. New Yorker Amanda Nisbet took a classic approach, using navy blue lacquer on the frame and blue and white check upholstery, and Manhattan designer Antonino Buzzetta simply went bananas. His version of the Bilou Bilou, which has legs covered in velvet studded with heavy metal spikes and black crystals sports a seat made from calf leather molded over a plaster form depicting a pair of bananas.